Piero Umiliani saw considerably opportunities in the field of library music and approached it with great energy and professionalism. He was also very prolific. So much so that he introduced a raft of pseudonyms to record under, created a number of bespoke record labels and founded his own recording studio called the Sound Work Shop in Rome, where he created both his library music and his film scores. The sound quality at the studio was excellent and Umiliani worked with the finest musicians on the scene, including the likes of Oscar Valdambrini, Gato Barbieri and the aforementioned Chet Baker. The composer himself was also no slouch, playing killer Fender, Hammond, Moog and more. 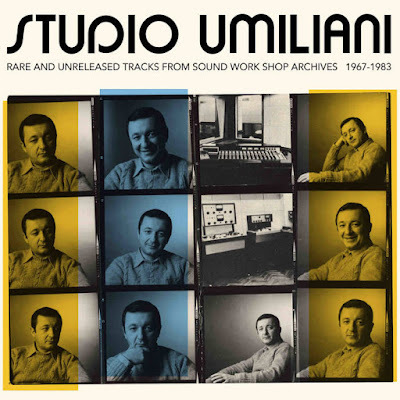 This two-LP vinyl combines some of the rarest of Umiliani’s Sound Work Shop cuts with previously unreleased material (“a sampling of sunken treasures and hidden beauties”) in a carefully curated set. There are a trio of film soundtrack themes, but the rest of the considerable playing time qualifies as library recordings. The music has been restored from the original master tapes enabling us to hear classic performances, beautifully recorded. Avventura has a wonderfully breezy, breathy, close-miked flute supported by discreet drums, panoramic Hammond organ and insouciant Fender Rhodes. The sound quality is first rate, with a terrific sense of presence. Missione speciale is a relentless suspense theme constructed from a tight repetitive pattern on electric bass anchored by a powerful upright bass, highlighted by skeletal piano and reinforced by shuffling drums. It develops into a free jazz feel, with the kind of carefully chosen random piano interjections you might hear in Sun Ra. On Petra – Tema Jazz, Enzo Scoppa cuts loose with his poised and scorching tenor sax and Cicci Santucci plays long, sinuous strains on trumpet, the two then uniting to intertwine, split up and reunite in swollen siren-lines, like a fleet of emergency vehicles racing to a calamity. The densely crowded urgency of the track, and the rawness of the tenor evoke Coltrane. Petra – Sottofondo generic in re minore is altogether more chilly, adding a slow but insistent pulse to this avant-garde sound world, with a harsh piano chipping away at the frozen surface urged on by the percussion and electric bass. L’invasione dei folletti (‘Invasion of the Goblins’) is just plain wild, a futuristic space probe of a selection featuring scurrying electronic figures which shriek and wail as the analog synths howl high overhead or disappear deep into echo. Grand Canyon is another synthesiser excursion, but this one is joyful and sunny and utterly infectious. The supremely wonderfully titled C’é un fantasma nel mio letto (‘There’s a Ghost in My Bed’) turns out to be a 1981 movie (“genere: commedia, erotico”). This theme from the film, simply designated M68 consists of lovely, eloquent sax and Fender with tight, swift drumming that begins to infect, intoxicate and infiltrate the saxophone solo, perceptibly accelerating its pace. Maddeningly, we don’t have credits for most of the musicians, although we do know the delicately etched and lilting Fender Rhodes is played by Enrico Pieranunzi. Another track from the same film score, called M47, with a mad Dixieland sound and a swing era beat, is really taken at a lick, with tart soprano sax, cheerful trumpet, worldly, loquacious clarinet and propulsive drumming. For Commandos, entirely breathless bongos drive the piece while near random electric guitar stabs and synthesiser swirls ornament it, with the occasional bass drum punctuation. It’s an object lesson in how a few elements can be assembled to tremendous emotional and musical effect. Il Burattinaio (‘The Puppet’) is a Latin excursion with a samba beat hung on glistening percussive vibes. This flow of music broadens out into a lush delta of celebratory Hammond organ. Le cascade di Iguaçú (the Iguazu is a river which rises in Brazil and has waterfalls on the Argentine side of the border) is a fantasia for ethnic percussion, yakety sax and whistling, chirping, singing synth. Pane, burro e marmellata (‘Bread, Butter and Jam’) in many ways is the essence of lounge music, a cheesy (to continue the continental-breakfast theme) bossa with vocals by the esteemed choir I Cantori Moderni di Alessandroni, plus user-friendly strings and electric guitar. In contrast, Ratko el l’orso – Tema Moog is a dreamlike tapestry of electronics, utterly hypnotic with its hovering, suspended flute.